Can’t Delete Apps From iPhone & iPad Using iOS 12 ? 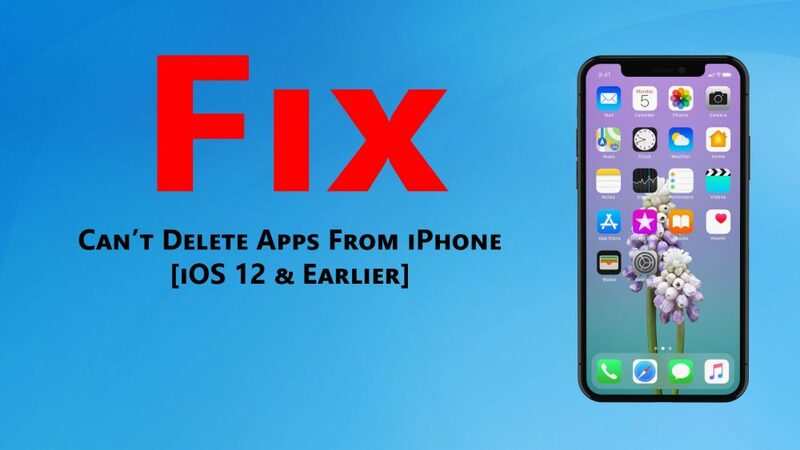 – Hello guys, in this guide, I’m going to show you a quick method that helps you to fix “Can’t delete apps on iPhone on iOS 12 & earlier problem”. guys, on my Facebook fan page, Several readers report that whenever they are trying to delete apps from their iPhone then they see “the apps would wiggle, but the remove button (X) was missing”. So this is the weird thing for those iPhone & iPad users, who are facing the same problem. I mean they are starting wondering why they are unable to delete apps from their iOS devices. So guys, after spending my lots of time on the internet. finally, Now I’ve discovered a quick solution and with the help of this solution, you’ll definitely fix the “Unable to delete this app” issue. Guys, actually, it’s a “parental control” feature that lets you stop deleting any app from your iPhone & iPad. so let’s go ahead and see how to delete apps on iPhone & iPad. Guys, firstly I’ll show you how to delete apps on ios 12 devices and then I’ll show you the solution for iOS 11 or earlier device. So first of all guys, all you need to do is just open your iOS 12 device and go to the “Settings“. In the setting, go to the “Screen time“. Here, go to the “Content & Privacy Restrictions” and enter the screen time passcode. Now, tap on “iTunes & App Store Purchases“. And here, all you need to just tap on the “deleting apps“. So, guys, with the help of the method above, you can fix the can’t delete apps on iOS 12 devices issue. Now, head over to the Home screen and try to delete the apps on your device. just tap and hold any app that you want to delete and click on the X. If you are using iOS 11 or earlier version user then you need to follow the method below. Guys, if you’ve still not upgraded your iOS version into iOS 12 and using iOS 11 or earlier then this solution will help you to fix the issue. Open your iOS 11 or earlier device and go to the “Settings“. Now, go to the “General“. Here, tap on the “Restrictions”. Now, what you need to do guys, just turn on the switch next to Deleting Apps under Allow section. That’s it guys, now you can delete any apps that you want from your iOS 12 or earlier devices. in that case, if you want to restrict others from deleting apps on your iOS device, then you just need to use the same method and turn off the toggle. So that’s it for this article guys, this article was about “how to fix ‘can’t delete apps from iPhone & iPad’ issue”. thank you guys for reading this article and being with us. hope you have got something from this article. guys, if you like this post then please don’t forget to share it with your friends, family members, and on the social media and also visit daily on this website for reading more new and helpful articles or you can follow us on our Facebook page then you will never miss any upcoming updates.